Here is what I am cooking for the Super Bowl. This week we were talking about taco salads at work and one person mentioned how much he like taco salad with Doritos. Another person disliked the idea of a taco salad made with Doritos. I was curious. When I saw this recipe on Ziplist I knew I had to try it. I had all of the ingredients in my refrigerator except for the Doritos and blue cheese crumbles.The source for the the picture and the recipe is the The Girl Who Ate Everything who got it from the Food Network. No better recommendation than a well traveled recipe. I plan to pair it up with some California Steam Lager I bottled last month. So without further adieu, here is the recipe. Preheat oven to 475 degrees. Spread tortilla chips on a rimmed baking sheet or in a shallow dish. Bring wing sauce and 1/2 cup water to a simmer. Add shredded cooked chicken; heat through. Strain the chicken (reserving the sauce) and spread over ranch-flavored tortilla chips. Top with shredded cheddar. Bake in the upper third portion of the oven until cheese is melted for about 5-7 minutes. 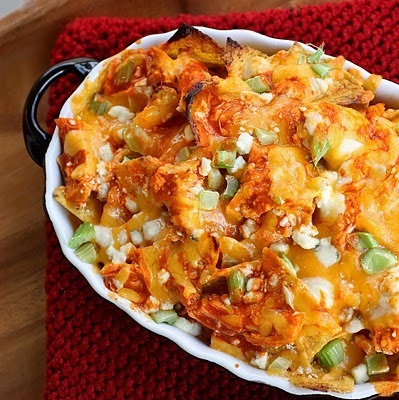 After nachos are baked top with blue cheese, chopped celery and the reserved wing sauce. Note: All these measurements are approximate. As with any nachos, adjust ingredients to your personal preference. ← Things That Make Me Go Hmm… Did Sen. Coburn lose his cancer doctor because of Obamacare?